Why hasn’t anyone established “MEAA” (Mini Eggs Addicts Anonymous) for all of us who have serious addictions to Cadbury mini eggs? This morning, I am allowing myself exactly 5 mini chocolate eggs. No more. They are addictive and probably the main reason I love Easter. The weather is beautiful today and while Shawn has been in the backyard, sanding the wooden rocking horse he is building for our little blue-eyed beauty, I have been decorating orange-scented Armenian Easter cakes called Paska. My grandmother Nina used to bake them in big coffee cans. Reputed to be very difficult to make (I will look into this for you), most people just resort to picking one up from a local Armenian bakery. Since I love a good challenge, you know I am going to be testing recipes for next Easter. And the one at the top of my to-do list is my godmother’s. She did all the hard work and I get the fun part of decorating them. Real marzipan was tinted with a few drops of food coloring and rolled out to about 1/8th of an inch thickness. I placed a plate over the top and traced around the plate with a sharp knife. It was centered over a round paper doily and draped over the cake. After sprinkling with some powdered sugar, a bowl placed over the top helped shape it around the paska. One is blue with bright orange poppies, a teeny bluebird and golden cross. The red one has a couple of birds and 3 pink-speckled chocolate eggs on top. On the back sits a teeny Chi Chai Monchan monkey and plastic daisy that is really just a button. Add milk and butter to a pot and set onto a medium-high flame. Heat just until butter has melted. Whisk eggs, yeast, sugar, salt, sour cream, vanilla and warm milk-butter. Gently incorporate 4 cups flour. Batter will be thick like yogurt. Cover and let it rise in a warm oven (about 100˚F) for 2 hours. Add remaining 5 cups of flour, one cup at a time. Dough will now be soft. Add raisins and orange zest. Cover and let dough rise another 2 hours in a warm oven (100˚F). Divide dough evenly into the three paper baking molds; try not to mix it or stomp it down too much. Let dough rise uncovered in a warm 100˚F oven again for 2 hours, til its filled the molds 2/3s full. Remove from the oven and preheat oven to 350˚F. Bake at 350˚F for 30-35 minutes in the middle of the oven until the top is golden brown. The day started with a breakfast mainly of hard-boiled eggs, because we had to decorate them for Easter, anyway. Afterwards, Daisy and I got right to work. A simple formula of food coloring, vinegar and hot water was perfect for dying the eggs. They dried quickly so we used ordinary clear Elmer’s glue and fine glitter to decorate them. Manicure stickers made the cutest embellishments. One has little heart-shaped Union Jacks all over it. We even have a Hello Kitty egg. That one is Daisy’s favorite. Notes: We used 2 shades of fine glitter and 4 shades of egg dye. Experiment with your own favourite colours. Cook eggs in boiling water for 10 minutes. Eat a Mini Chocolate Egg. Remove any cracked ones and eat them the same day. While the eggs are cooling, boil a teapot of water. Pour 1/2 cup of boiling water each into 4 coffee mugs. Add 1 teaspoon of vinegar into each. Using a spoon, gently settle an egg into each mug. Set a kitchen timer to 5 minutes. gently place them into the empty egg carton. Repeat until all eggs have been dyed. Eat another Mini Chocolate Egg. Transfer back to egg carton to finish drying. have not been covered with glitter. Display proudly on your Easter table. Spring is a wonderful time of year that everyone can celebrate. The trees are covered in blossoms, baby birds are heard chirping, the sun comes out of hibernation and makes everything shine. And the Easter Bunny brings plenty of good chocolate. Daisy and I are now covered in glitter, but we do not really mind because we had so much fun together. Celebrate the season with these beautiful eggs that will add sparkle to your spring-time table. Love these glittery eggs and Happy Easter Colette! Please email me your shipping address! Thanks, ladies. Happy belated Easter to you, too. Love your avocado deviled eggs. Can't wait to try them. Thanks, Dawn! What a wonderful Monday. Saw your coconut meltaways recipe this morning – I have to bake them tonight. YUM! How lovely! 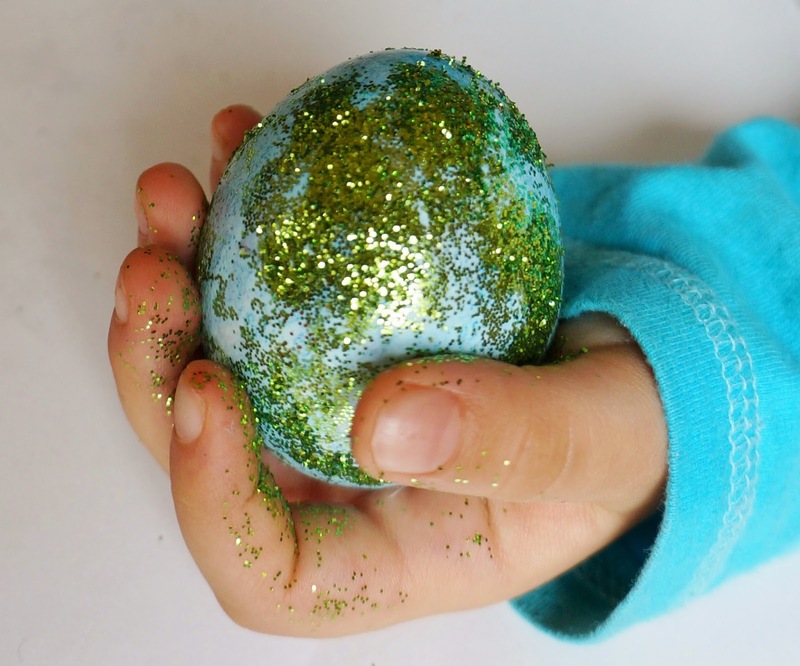 the glittery eggs are GORGEOUS! what fun for your lovely little daughter – it's so great to pass on these traditions! Yes, Mary. Now that Daisy is old enough to participate in these celebrations, the holidays are so much more meaningful.